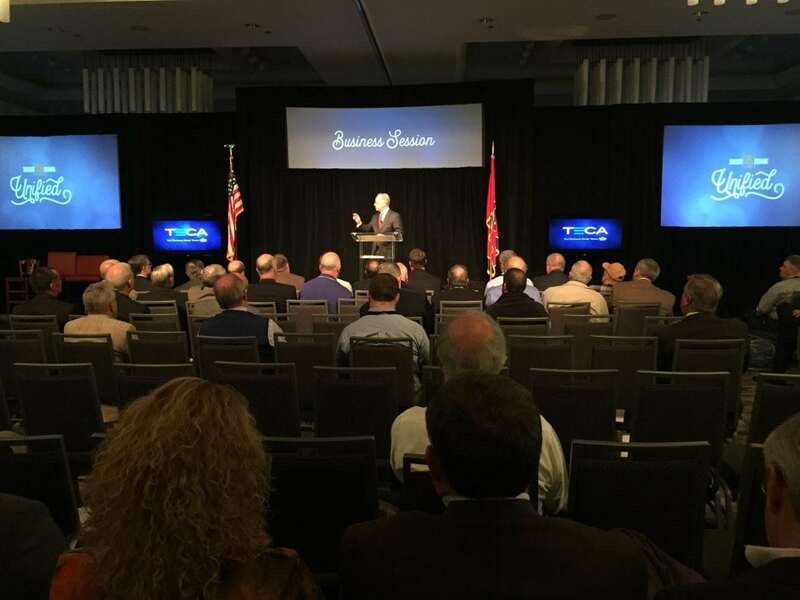 NASHVILLE – “Unified” was the theme of the 75th annual meeting of the Tennessee Electric Cooperative Association, held Sunday, Nov. 20, through Tuesday, Nov. 22, in Nashville. More than 350 electric cooperative leaders from across the state attended the event, and were reminded that they best serve consumer-owners when co-ops work together for a common purpose. The first Dr. K. T. Hutchinson award was presented to Sen. Ken Yager in honor of his courageous support of electric cooperatives and rural Tennessee. Dr. Hutchinson was instrumental in the formation of electric co-ops in Tennessee in the 1940s and served as the first president of the Tennessee Electric Cooperative Association. During the meeting, elections were held for positions on the association’s board of trustees. Michael Watson, general manager of Duck River Electric Membership Corporation in Shelbyville; Larry Storie, a director for Volunteer Energy Cooperative in Decatur; and Steve Sanders, a director for Gibson Electric Membership Corporation in Trenton, were elected to four-year terms. The second annual TECA Top Tenn Communications Awards were presented during the event. Duck River Electric Membership Corporation received an award for Best External Newsletter or Magazine Section; Appalachian Electric Cooperative, Best Internal Newsletter; Cumberland Electric Membership Corporation, Best Website; and Sequachee Valley Electric Cooperative, Best Use of Social Media. Gibson Electric Membership Corporation and Middle Tennessee Electric Membership Corporation each received Awards of Excellence in the Wild Card category, with Duck River Electric Membership Corporation, Sequachee Valley Electric Cooperative and Appalachian Electric Cooperative earning Wild Card Awards of Merit.